Effective Quality Control is at the heart of a good dimension program. At Challinor Wood Products we work hard to insure the best quality and reliability possible by thorough communication and mill relationships. We never assume that a customer's requirements are "standard". We visit the customer's plant (perhaps his showroom, his machine floor, his finishing room, etc.) to better understand his needs. Dealing with a natural material such as wood, requires a visual, as well as a mechanical specification. Before quoting prices we discuss the customer's individual specification with the mill–including how the product will be used, what finishes will be applied, the allowable defects, machining tolerances and color range. We often take samples of the customer's product to the mill to use as training aids and to show the factory personnel how their individual decisions on the factory floor will affect the finished product. During production of the first several shipments to a new customer, we travel to the mill and inspect the material, either during production and/or when it is ready for shipment. We normally visit a new customer after they have received the first shipment as well, to make sure that quality is acceptable, and to discuss any changes or modifications that can be made on future shipments to improve the quality, streamline the customer's manufacturing operations and achieve further savings in raw material costs. 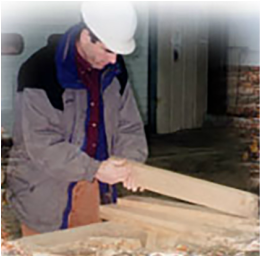 One reason we take such precautions is that Challinor Wood Products guarantees the quality of each and every shipment. We feel that running just a bit worried is your best guarantee of our shipping consistent, good quality material.